Soosiz is the first game by Touch Foo. Don’t let the graphics fool you; any other graphics and this wouldn’t be Soosiz. The music and sound effects are OK. It is what you would expect from a platform game like this. The game play is unique. I really like the gravity element for each “planet”. I don’t know what else to call it. I will call it platforms for the review. Jump to a platform and gravity will take hold; adjusting the view for you. It gets pretty intense in some levels leaving me dizzy with the platform jumping and gravity switching. 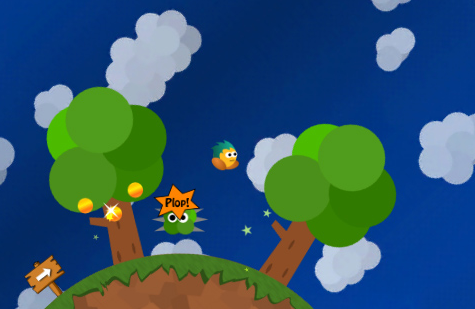 In the game you have to rescue your little friends which in turn give you special abilities. Other added game elements are collecting gold coins. 100 gold coins gives you Star Power. Star Power is the same concept as in Mario. It makes you invincible letting you run through enemies. I really enjoyed the secret blue coin levels. You need to collect 50 blue coins within a certain time limit. The physics for the blue coin levels is perfectly done. The controls are simple and everything is on the screen. It is intuitive and simple. This is my biggest caveat. I do not like D-pads, hunting around menus for gameplay controls or overly complex flow of gameplay. Soosiz has exactly what I am looking for, a good gameplay flow. If I want something complex I will go play Eve Online. I am always on the look out for anything unique when it comes to UI. Actually, I enjoy seeing new concepts of anything. Soosiz does something cool that I really like. The main menu changes to reflect the level you are currently on. Soosiz delivers in a big way. This game comes highly recommended and will not disappoint. It is in my top five games, and will always be on my iPhone. I would love to do a live interview with the developers, hint hint. Awesome game, all should buy it! Finally I see an Apple “Loco Roco” game! I loved that title on my PSP, I can’t miss this on my ipod touch!